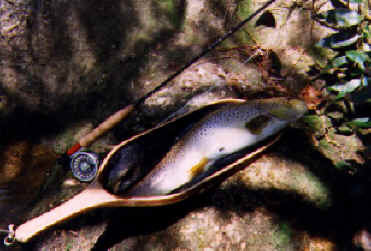 A Twenty Two inch Dukes Creek Brown Trout caught on a Blue Ridge Rod. Dukes Creek is in the Blue Ridge Mountains of Georgia and has been featured on ESPN's Fly Fishing America. Click the Hyperlink for each description for more information on the individual product lines. Blue Ridge Fly Reels and Lines. As well as Jim Teeny Specialty Lines: We proudly introduce our own line of fully machined, disc drag, bar stock aluminum reels at unbelievable prices, starting at $97.50. Our fly lines are available in 4 to 8 wt, and are only $16.00. These are slick, high floating lines. If you need a specialty line, we are a distributor for Jim Teeny lines. Click on in and be impressed by the reels. "Loomis Blem" Rods and Blanks: Blue Ridge Rods was founded on building high quality fly rods on cosmetically blemished Loomis blanks. We only have a few 7 1/2' to 8' 2-4 weight blanks left. The 7 1/2' 3 wt is a GREAT rod. New: Tail Water, Balsam Mountain and Caster Series rods. The Tail Water and Balsam Mountain Series rods offer the finest rods money can buy. Built around Twenty First Century graphite, resins and tapers; these rods are unmatched for quality and value. The Caster Series offer beautiful cosmetics, solid performance and low pricing. Accelerator+ Series, Smoky Mountain and the original Blue Ridge Series Rods. These rods are built on first quality blanks constructed from high tech aerialized graphite and state of the art resins. They make some of the finest rods available in the world today, at incredible prices. These rods start at $155.00 for the two piece 6' Blue Ridge 2/3 wt. Additionally, we can build on or supply you with almost any blank or component available on the market today. E-mail for more information. Hi, I thought I'd let you know that I've finished the rod kit you sent me some time ago. Everything was super, the blank as well as the components and of course the price ! Just for the fun of it I practised some distance casting and measured my casts with a yardstick - several casts over 130' and I believe that if I practise more with this rod 150' is no problem. It is hard to believe that this really was a blem. Carl Holmkvist Professional game angling instructor Member of A.P.G.A.I.